MANILA, Philippines – (Updated April 19) The Department of Education (DepEd) is expected to release results of the December 2018 Principals' Test formerly known as National Qualifying Examination for School Heads (NQESH) between April and May 2019 or 5-6 months after the exam. The complete list of passers and top 10 (topnotchers) are available on this page as announced online. DepEd through the Bureau of Human Resource and Organizational Development (BHROD) and the Quality Assurance Divisions of the Regional Offices (RO-QAD) administered the 2018 Principals' Test on December 9 in at least 26 exam centers nationwide. The administration of the test is DepEd's mechanism to select school heads in the public education sector - a qualifying process for interested applicants to Principal I positions. It is being implemented in coordination with the Schools Divisions Offices (DOs) through the Regional Offices (ROs). The test covered the competencies anchored on the domains of the National Competency-Based Standards for School Heads (NCBSSH) stipulated in DO 32, s. 2010 entitled National Adoption and Implementation of the National Competency-Based Standards for School Heads. In order to pass the test, takers must obtain a rating of at least 70% in each of the clustered domains. DepEd said that official results will be released through a Memorandum followed by the distribution of printed Certificates of Rating (CoR) to all test takers through the RO-QAD. Takers may expect results to come out around April to May 2018. Any development on the checking of test papers or unforessen circumstances may change the probable release date. In the December 2017 Principals' Test, results were released in 5-6 months after the exam. Only 5,111 out of 20,653 (24.75%) passed the exam. Grant B. Gubatan from Region 1 and Rhoda O. Dela Cruz from Region 4A tied on highest spot. In the April 2017 (2016 Principals' test), results were announced after 5 months. A total of 388 examinees out of thousands aspiring school heads successfully hurdled the exams. The top 10 passers list was led by Christian N. Sango of Region XI. In the October 2015 exam, 2,195 out of nearly 19,000 takers passed the exams. Results were out online in less than 3 months. Erwin John Santos from Region 3 and Garry Vacunawa from Region 8 led the passers. 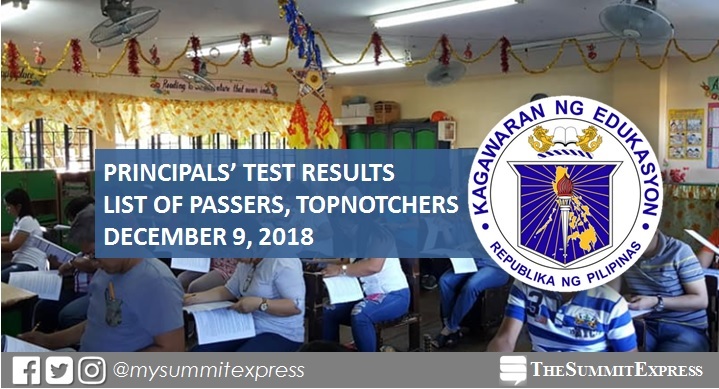 Monitor this page for real-time updates on 2018 Principals' Test. You may also visit the website and Facebook pages of DepEd and BHROD for more information.